December 5, 1887, through to May 12, 1888. Petrie begins the season excavating in the temple of Sobek at Medinet el-Faiyum, then moves on to Hawara where he surveys the pyramid, as well as finding many mummy-portraits from the Roman Period cemetery there. Main sites: Medinet el-Faiyum and Hawara. Other sites: Byahmu (Biyahmu), Medinet el-Gurob (Ghurab; Gourob). Some pages have split along the folded edges, these have been housed in glassine envelopes. Petrie, W. M. Flinders, Hawara, Biahmu and Arsinoe (1889) (OEB 147074) http://digi.ub.uni-heidelberg.de/diglit/petrie1889 (accessed 21/03/2018). 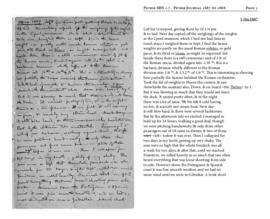 Petrie, W. M. Flinders, Seventy years in archaeology , 81-9 (OEB 147191). 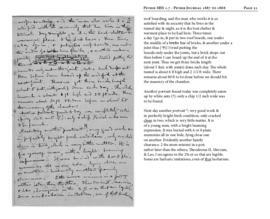 Drower, Margaret S., Flinders Petrie: a life in archaeology (1985), 130-41 (OEB 29381). Drower, Margaret S. (ed. 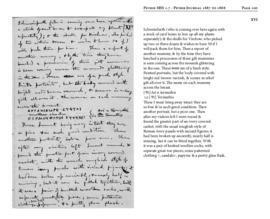 ), Letters from the desert: the correspondence of Flinders and Hilda Petrie (2004), 66-7 (OEB 154602).